Many call centers claim that their supervisors spend approximately 50% or more of their time coaching CSRs to improve the customer’s contact center experience, but SQM is of the opinion that this is inaccurate. In most cases, four to five calls per CSR, per month are evaluated and CSRs are coached once a month for less than one hour. That means that, typically, a CSR only receives 1.5 days total coaching time on an annual basis and, in most cases, the coaching information is based on a traditional QA process. Also, across most of SQM’s client base, the vast majority of supervisors are promoted from a CSR level. Coaching can be challenging for supervisors who are promoted from the CSR level and not properly trained to coach CSRs. Coaching is a skill that needs to be learned and practiced. Many CSRs are uneasy about receiving call coaching from their supervisor because their coaching style tends to focus on the negative side of the call. Although there are always areas that a CSR can improve on for call handling, they should not be the sole focus for a coaching session. The most common feedback SQM receives from CSRs about coaching is that their supervisor is not skilled at coaching them on how to improve their call resolution and Csat performance. It stands to reason that if the traditional QA process is not effective for helping improve CSR call resolution and Csat, then how can a supervisor be successful at coaching to improve CSR performance when they are using the traditional QA process? SQM agrees with the vast majority of contact center professionals’ opinion that coaching CSRs is critical. The opportunity through CSR coaching is to improve its effectiveness for helping CSRs resolve calls, and improve Csat and Esat. Given the great opportunity to improve CSR call resolution and Csat coaching, all supervisors should be required to be trained on how to effectively coach CSRs to improve their VoC performance. The figure below shows an ongoing four-step VoC CSR coaching model for helping CSRs improve call resolution and Csat performance. Using customer survey data and feedback is a best practice for coaching CSRs to improve FCR/call resolution performance. The vast majority of world class FCR performing contact centers use customer survey data and feedback for CSR coaching and accountability. Post-call surveys are external FCR/call resolution methods with the outcome being determined by the customer. Given that the average CSR receives only 6 to 12 hours a year in coaching, it is essential to make the best use of those coaching hours. 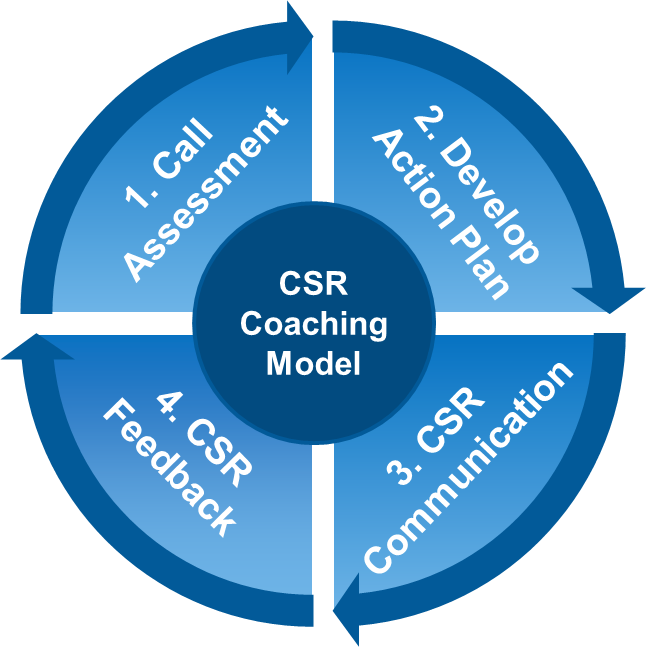 It is a best practice to target CSR coaching using non-FCR calls. SQM recommends 10 surveys per CSR, per month, which represents a total of 120 surveys annually. Again, SQM research shows that for the average contact center, FCR is 70%, call resolution is 88% and CSR source of error (SoE) is 38%. Therefore, for a CSR who receives 120 completed customer surveys a year, only 6 of those surveys would be CSR SoE (e.g., 120 surveys x 12% unresolved calls x 38% CSR SoE = 6). Thus, there are limited coaching opportunities to improve CSR call resolution based on unresolved calls that can be attributed to a CSR SoE. Using non-FCR calls to target CSR coaching allows for more opportunities to coach compared to using unresolved calls. Many contact center managers struggle with the frequency in which they should deliver customer survey results and reports to their CSRs. At a minimum, World Class Call surveys and unresolved call surveys should be shared with CSRs within one business day of the survey being completed. CSR trending reports for Csat and call resolution performance on how well the team and contact center are performing should be shared weekly. CSR coaching reports on what they are doing well and what they should improve should be shared on a monthly basis. In world class contact centers, supervisors commit 30 minutes to 90 minutes per CSR, per month to delivering the KPI reports. As a result, CSRs are able to maintain or exceed world class KPI targets. Criteria: This award recognizes the organization that has demonstrated a CX best practice which improved, or helped maintain high first call resolution (FCR) and customer experience (CX) performance. In 1886, William A. Foote, a flour mill operator, teamed up with Samuel Jarvis to secure a street lighting franchise agreement with the city of Jackson. What began as the illumination of a dozen streetlights has now become Consumers Energy Company (CE). CE is one of the nation's largest combination utilities, providing electric and natural gas service to almost 6.5 million of Michigan’s 10 million residents and serves customers in all 68 counties of Michigan's Lower Peninsula. Consumers Energy is the principal subsidiary of CMS Energy Corporation, a Michigan-based company that also owns and operates independent power generation businesses. Learn how their Growth and Development (G&D) program was designed to create meaningful, consistent coaching for CSRs while empowering them in their own development. For over 75 years, Blue Cross Blue Shield of Nebraska has been an important part of Nebraskans’ lives. They are the only health insurer exclusively serving Nebraskans and employees of Nebraska-based companies. They are the largest tax-paying non-profit in Nebraska and provide health insurance coverage or benefits administration to over 730,000 members. The changes in healthcare over the last several years have created many challenges for their members. Customers need to be able to manage their health care costs and understand their insurance coverage to make the best decisions for themselves and their families. Blue Cross Blue Shield of Nebraska is helping to control costs by leading the way in supporting patient-focused value-based partnerships that deliver quality care in the most cost-effective manner. They have also vowed to make every customer experience world-class by empowering their Customer Service Representatives to creatively resolve issues by providing compassionate, practical solutions. Their goal is to inform and educate their members and help them navigate the complexities of the healthcare system. Learn how they created a team that focuses on continuous coaching to drive improvement and world class performance and has led to better CX performance results, impressive coaching surveys, and an improved culture. Mr. Cooper is the consumer brand for the mortgage servicing and originations operation of Nationstar Mortgage Holdings Inc. (NYSE: NSM). Based in Dallas, Texas, Mr. Cooper is one of the largest home loan servicers in the country focused on delivering a variety of servicing and lending products, services and technologies to make the home loan process more rewarding and less worrisome. During 2017, Mr. Cooper acquired approximately 1 million new customers, and our staff grew by 400+ agents. Nevertheless, in spite of their low tenure, by using this highly effective CSR coaching program, along with the survey feedback received from SQM, they have been able to continuously improve their overall performance. Their case study summarizes the key components of how their award-winning CSR coaching CX best practices work. Criteria: This award recognizes an organization that has demonstrated a best practice which helped improve, maintain, or provide a positive CX. Nationstar is one of the largest and fastest growing mortgage servicers in the United States with a servicing portfolio in excess of $400 billion and more than 2.4 million customers. Nationstar offers servicing, origination, and transaction-based real estate services to all of our customers, including: homeowners, homebuyers, home sellers, investors, and other real estate market participants. Our contact centers have a relentless focus on providing quality service to our customers. Our primary call center is in Irving, TX with partner call centers across the U.S. and in Manila. Criteria: There are 15 distinct Best Practice Awards (i.e., Omni-Channel, Web Self-Service, IVR Self-Service, Chat Channel, Quality Assurance Program, Desktop Applications, CSR Recognition Program, Career Development Program, Call Handling Practice, Real-Time CSR Support Queue, Performance Management System, CSR Coaching Program, CSR Training Program, CSR Hiring Process, Standard Operating Practices). These awards recognize the organizations that have demonstrated they have improved or helped maintain high first call resolution and customer satisfaction performance. Criteria: There are 10 distinct Best Practice Awards (i.e., Quality Assurance Program, Desktop Application(s), CSR Recognition Program, Career Advancement, Call Handling Practice, Real-Time CSR Support Queue, Performance Management System, CSR Coaching Program, CSR Training Program, CSR Hiring Process). These awards recognize the organization that has demonstrated they have improved or helped maintain high first call resolution and customer satisfaction performance. MedSolutions began in 1992 as an owner/operator of diagnostic imaging centers, but quickly saw an increasing need in the managed care industry for intensely focused radiology benefits management. In 1997, MedSolutions sold their diagnostic imaging centers and set out to focus solely on managing the cost of imaging and helped pioneer the new industry of radiology benefits management. They were soon established as an industry leader, helping healthcare payers control the soaring costs in radiology. Today, MedSolutions has taken the clinical knowledge, proprietary technology, and forward thinking perfected in radiology management and applied it to other areas of healthcare where there is opportunity for significant improvement, both in quality of care and in cost savings to health plans. MedSolutions continues to evolve to meet the challenges of the healthcare industry through Intelligent Cost Management, developing and introducing new services that extend beyond utilization management to capture maximum savings, reduce overall treatment costs, and ensure diagnostic accuracy. MedSolutions’ processes are built and optimized around the fact that a patient is waiting for evidence-based input on treatments and tests that are important to their health. First Call Resolution (FCR), accuracy and client, provider and member satisfaction are very critical aspects of these processes. With this in mind there was a need to build a strong customer service representative (CSR) base, as this is our frontline representation. FCR and Customer Satisfaction (Csat) are most effectively attained at this level of interaction.